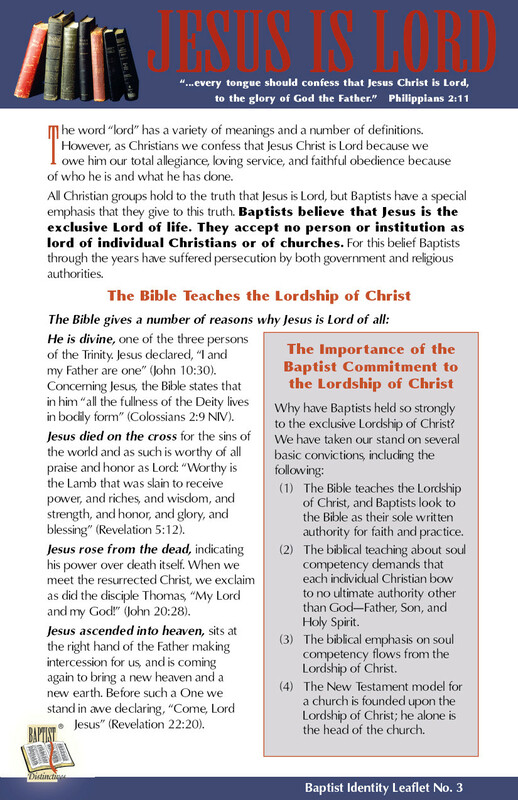 Baptists: What Makes a Baptist a Baptist? “I just believe in being a Christian–I don’t want to be part of a denomination.” Have you ever heard a statement such as this? It seems very pious, but it makes it sound like there is something wrong with being part of a denomination of Christians. 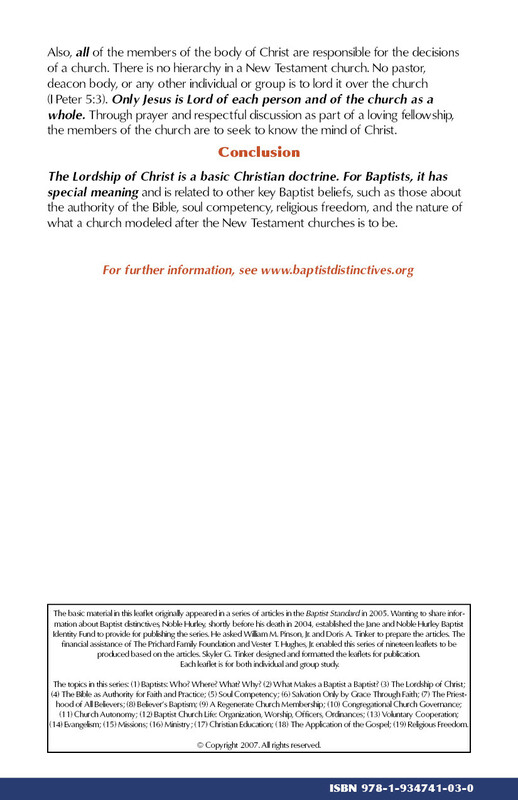 A combination of beliefs and practices sets Baptists apart from other Christian groups. 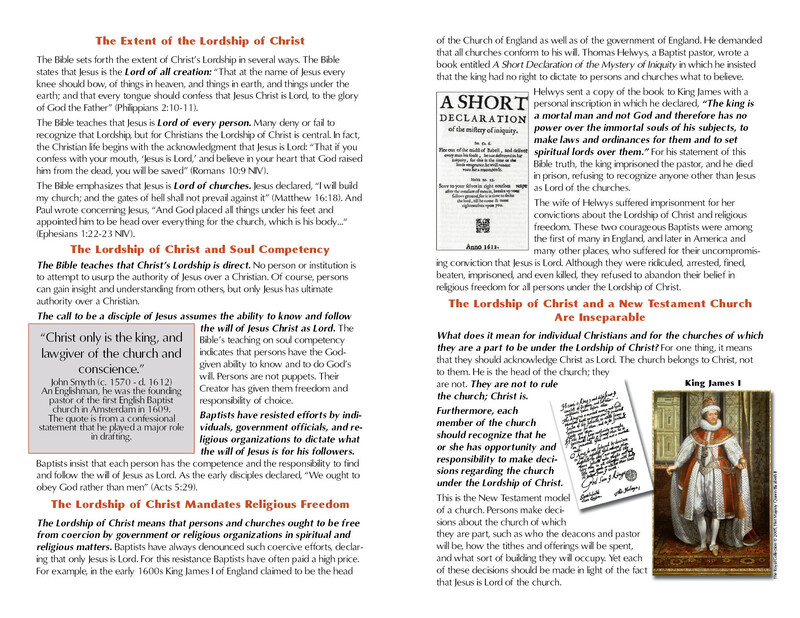 There is a distinctive group of doctrines and polities for Baptists, a sort of Baptist recipe. Like most recipes, each of the ingredients is not unique to Baptists, but the total mix is distinctively Baptist. Although some of those ingredients are part of the recipe for other Christian groups, no other Christian group has the same combination of beliefs and practices as Baptists do. What are these key ingredients in the Baptist recipe? Some of them we have in common with Christians of most all denominations, such as belief in God and in Jesus Christ as Savior. However, Baptist beliefs about some major matters differ from those held by certain other groups. 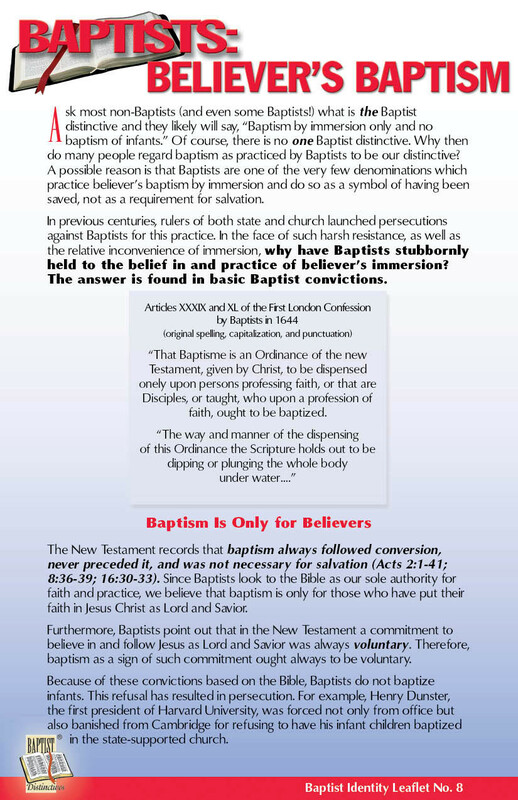 For example, although practically all Christian groups declare that baptism is significant for Christians, Baptists hold a different view of baptism than most. In the weeks to come, this series will discuss what that difference is and why it is important. In order to carry these out, Baptists have organized in various ways beyond local congregations, such as associations of churches, societies, conventions, fellowships, unions and alliances. Baptists have also established numerous institutions such as those for education, missions, and the care of children, the aged and the ill. The common ingredient in all of these is voluntary cooperation. 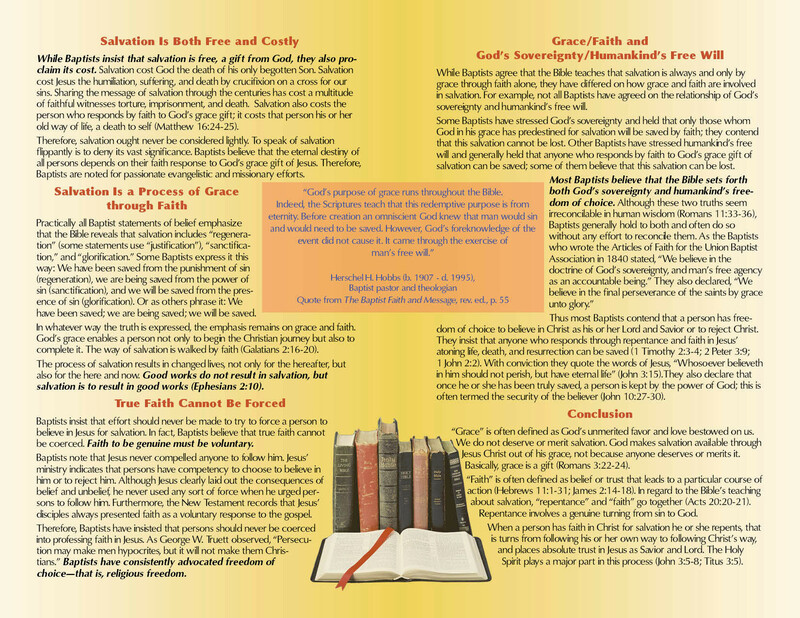 Baptists endeavor to base each belief, practice, emphasis and organization on the teachings of the Bible. The desire of Baptists is to be as close to the New Testament model for an individual Christian and for a church that is humanly possible with God’s help through the instruction and empowering of the Holy Spirit. 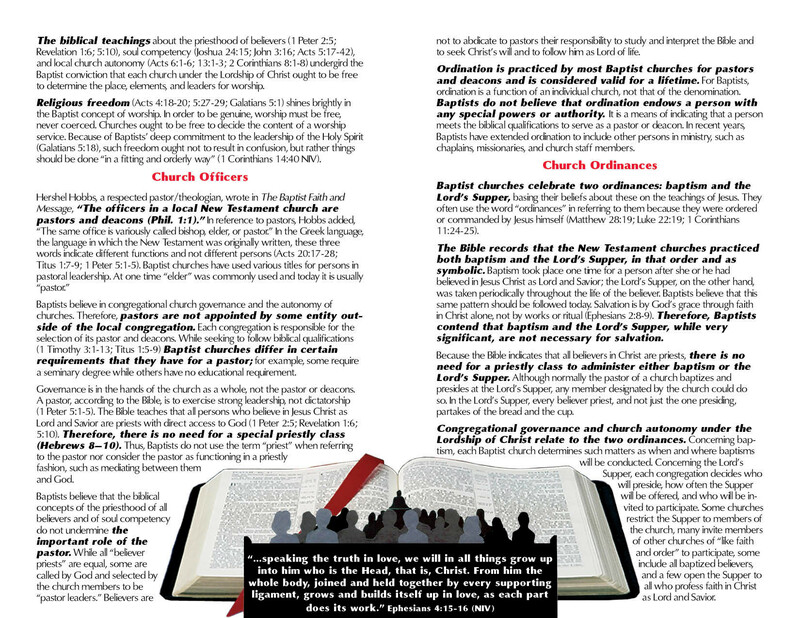 What difference does a person’s denomination make? It makes a lot of difference. 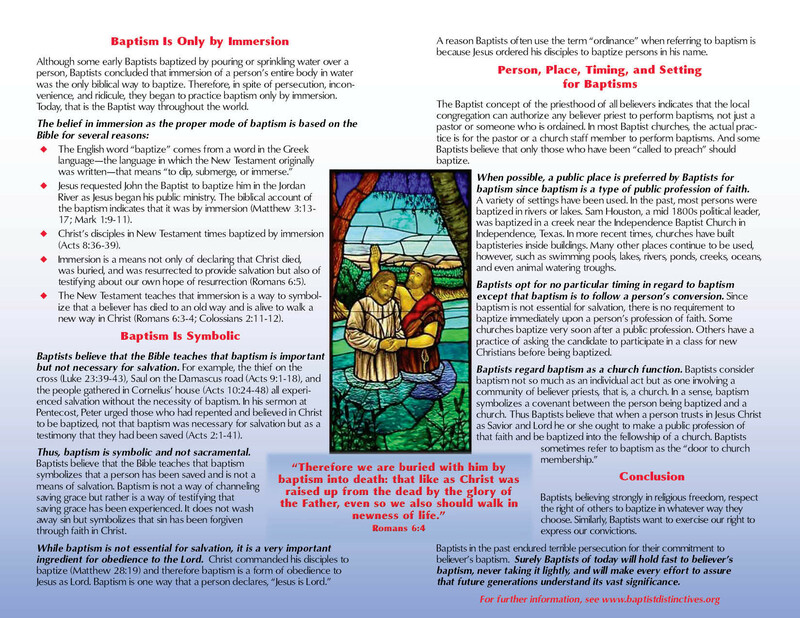 There are wonderfully dedicated Christians in various denominations, but there are distinctive beliefs which we hold dear as Baptists that are compelling reasons to be part of the Baptist denomination. 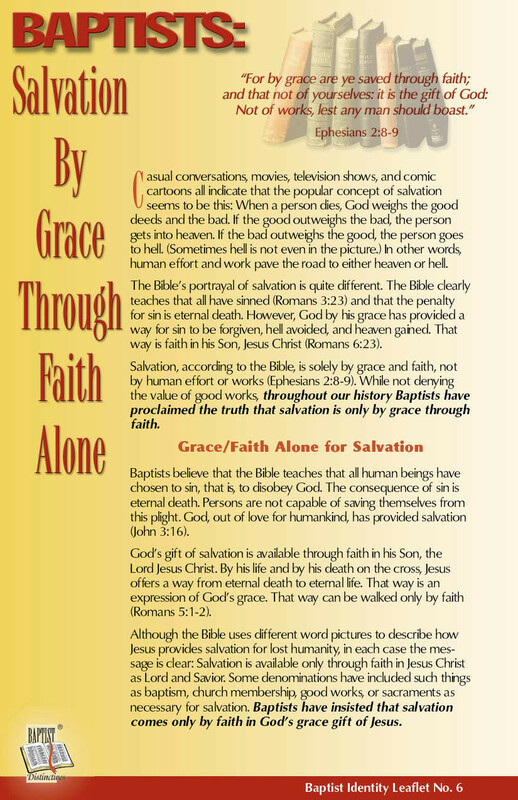 For example, Baptists hold that salvation is by grace through faith alone and not grace/faith plus baptism, or sacrament, or church membership. Baptists insist that a church ought to determine who its pastor will be rather than having a pastor assigned by a person or a group outside of the local congregation. 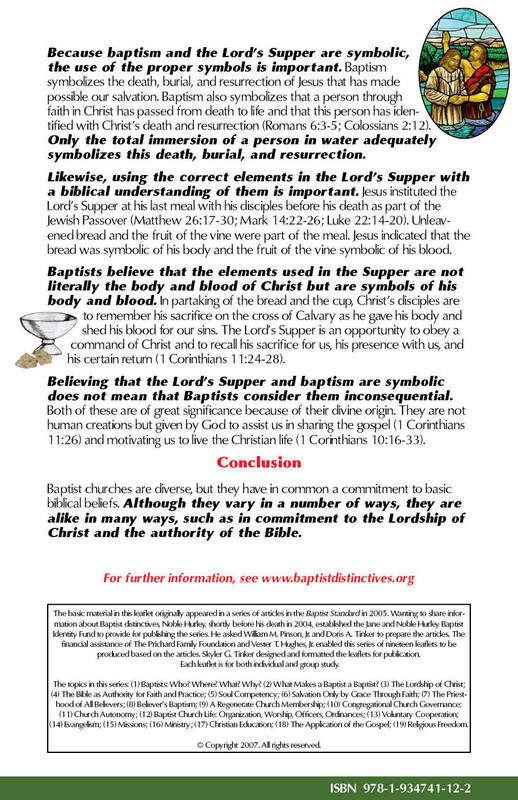 Does the Baptist denomination matter? Yes, most definitely! The Baptist denomination has made and continues to make a difference in the world. For example, we are free to worship in our country due in large measure to the sacrificial and unselfish efforts of persons who were part of the Baptist denomination. 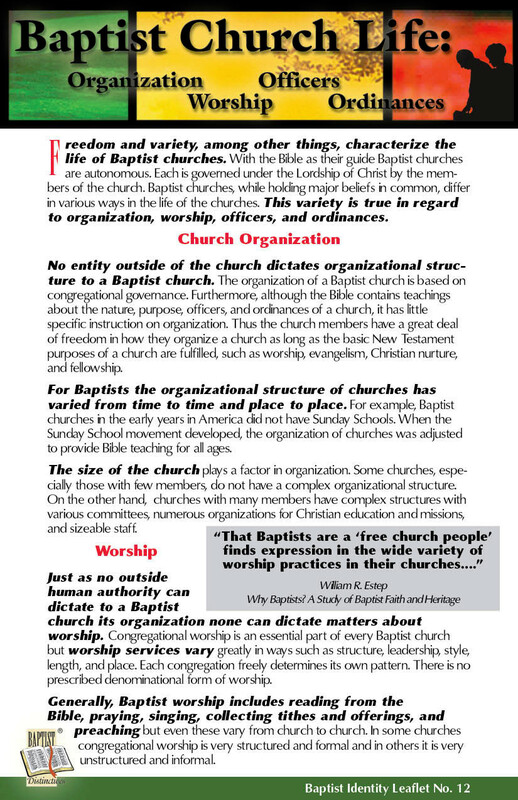 Baptists have championed religious freedom for all to worship according to the dictate of conscience without interference of government or religious organizations. They have done this in spite of persecution. Baptists continue to work for religious freedom for all persons throughout the world.